I am totally in love with the colors, and I like the solid fabrics. This time I used a regular zipper because I didn’t have an invisible zipper in the right color. You can’t really tell in this photo, but the zipper doesn’t match the fabric. 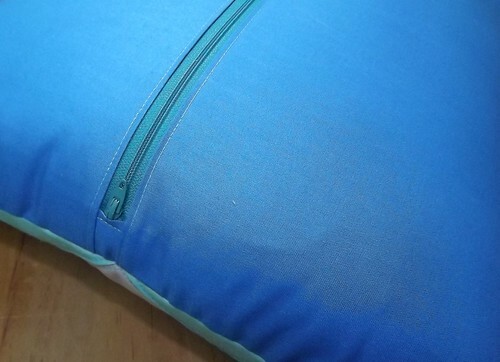 Instead, the zipper is a dark aqua, and I think it’s a fun contrast without being too noticeable. This pillow thing could be a problem. But in the meantime, I’m linking up – again – with the Pillow Collective at Amy’s Creative Side. 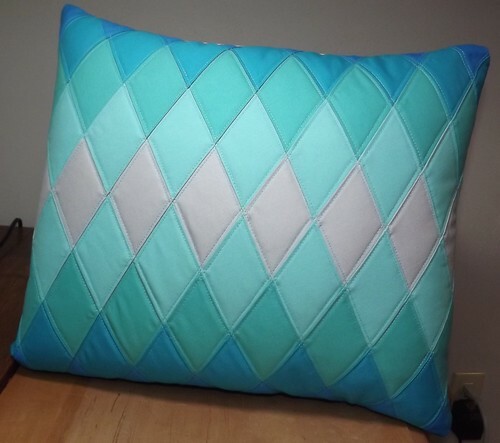 That is a gorgeous pillow! Love the colours and the design! I love the colour graduation…so soft…so pretty. What a beautiful pillow. Very pretty! So clean and fresh looking! 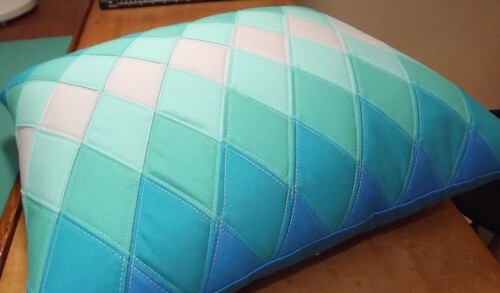 I love the colour combination and the texture created by the quilting. It’s only a problem if you make it one. Says the person that only today removed 3 pillowless pillowcases from the livingroom that had been lying around for months. I keep making pillowcases while I only have 1 pillowform to stuff it with so each time I make a new one I switch it (small couch and boyfriend who doesn’t like pillows, crazy right?). Nicely done. Great job on the zipper, too!